It's September 15 and you know what that means! Garden bloggers all over the blogasphere are celebrating Bloom Day. You can see more gardens then you can imagine in one day if you stop by Carol's blog, May Dreams Gardens to take the linky magic carpet ride. Here's mine~The order does not reflect favoritism! Almost everything that grows here does double duty~It must look good for at least part of the year and feed pollinators, birds and other critters. Bat Faced cuphea "Little Mice"
A long look at the front garden that includes some of the Susan's border, The Waiting Bench and native wildflower woodland. The garden looks rag tag after a summer of extremes and gardener absence~But, gardens can be very forgiving and losses mean opportunities. Right now, we are waiting on the asters, goldenrod and other fall bloomers to light up the garden. We would also like cooler weather! Who do I talk to about that? Thanks for stopping by....Have fun out there. Your pictures are outstanding! And it appears your hard working flowers are putting in overtime. Thanks for joining in for bloom day, once again. What gorgeous photos. The butterfliy images are stunning, especially the buckeye.Poor guy has a notched out wing. Beautiful photos. I also warn people about the autumn clematis. I'm still trying to get rid of shoots. And in my climate I only got the flowers for a day or two before the frost did them in. I have a whole field of goldenrod - planted by Mother Nature. All still looks amazingly grand for mid-September, dear Gail. Love all photos, especially Lantana with friend! Enjoy the remains of summer. Hi Gail - good to see your blooms looking wonderful, I really fancy a Veronium having seen them on a few GBBD posts - yet another plant to add to the wish list! Your garden is a knock-out. I am mesmerized by that last photo....I could spend hours puttering around there. Gail, I would like to send you some of my cool weather. It has delayed the asters. I just hope we do not head to late fall weather so soon. Your garden looks very happy, even with your yoyo weather. Your garden looks really good. Your photos were wonderful. Those close ups with the insects are amazing. Beautiful garden! Beautiful, Gail! I love your blackberry lily and your butterfly. Isn't it interesting how the body of the butterfly mimics the wings perfectly? Great shot! Gail, your flowers, and their friends, are gorgeous. As for cooler weather, I'd be happy to send you some! Could you send us some warm and sunny weather? If you find out who the weather person is, see if he/she can send a little rain my way. Have a great GBBD! Well said, losses can represent opportunities! Happy Bloom Day! Hi Gail, I love that Salvia!! Despite the drought, your front garden looks so lush and green, Gail! But best of all, it's obvious the pollinators are happy here. I'm envious of that Blackberry lily, but thanks to Frances, I have plenty of seeds for next year. Off to have coffee with Cheryl and Lisa before they leave. What a wonderful two days we have had! I'll be sure to give them a goodbye hug from you as well. I can't wait for the cooler weather. It teased us a week ago with some great temps. Maybe we'll get rain today but nothing here yet! I like your NOID salvia! For that one I guess you don't "Avoid the NOID!" The Volunteer Sweet Autumn Clematis does look so sweet - I bet I could find a spot for it and it could be as invasive as it wants to be! Sweet blooms abound in your garden this month, Gail. I particularly like the Sweet Autumn Clematis and the Blackberry Lily. But some of those really pretty plants do have a dark side when they're so invasive -- like my Cypress Vine and Coral Trumpet vine...they're trying to take over! Happy GBBD. Well I am smitten, if that's what a mixture of clay and limestone soil can grow wow! Flowers and fauna is a wonderful way to celebrate bloom day. Gail, delightful Bloom Day post. You have so much still in bloom-even a blackberry lily! The Buckeye on the verbena could have been taken in my garden. :) We have has many, many visiting this year. 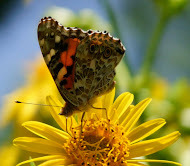 Isn't it wonderful to have butterflies this year?? Many sweet flowers at C&L. I wonder if our colder climate might keep 'Sweet Autumn's' invasive tendencies at bay? They do climb all over. I've never had one... not sure I want one. However my friends that have them must provide Very Substantial structures for their climbing! Well, I thought we were getting a little cooler air, and we are, if I get up early enough! Our days are still hot, in the 90s, and we have had no rain for two weeks. Although we had a fairly wet summer, my garden is turning crispy. Yours still looks beautiful! Even tho the Summer season is waning your blooms are amazing. I am always in awe when I see your blog with all those beautiful blooms. That salvia is awesome! Enjoy the cooler weather this weekend-I think the weatherman listened. Gorgeous! I love that Vernonia...and the Anemone is just lovely! Your front garden looks very inviting to me! That Verbena bonariensis is invasive where I live - I do like it though and am sad that I can't use it. I love your critters in the blossoms! You have such a peaceful garden..lovely flower closeups. Gail girl if I could send my COOL weather that I am having this morning, down to you I WOULD !! I love looking at your pictures especially those little creatures that visit your garden : ) they are beautiful ! I can see why Sweet Autumn could be invasive .. it is gorgeous here right now but our winters keep it in check for sure ! I love that clematis. Isn't it funny how one person's dream is another's nightmare? I struggle to get clematis to grow up here and find it hard to imagine one which is invasive! Well, I wish I could ship you some of our cooler weather! It's felt very much like fall this month. We rejoiced to get up to the high 70's a couple of days this week. Now it's rainy and grey. I hope you have a nice fall before winter sets in. Gail, your garden is pure delight..and more so because of the delight you take in it and share with us. Your polinator pics are wonderful, as are your flower and garden photos. They always give me such pleasure. 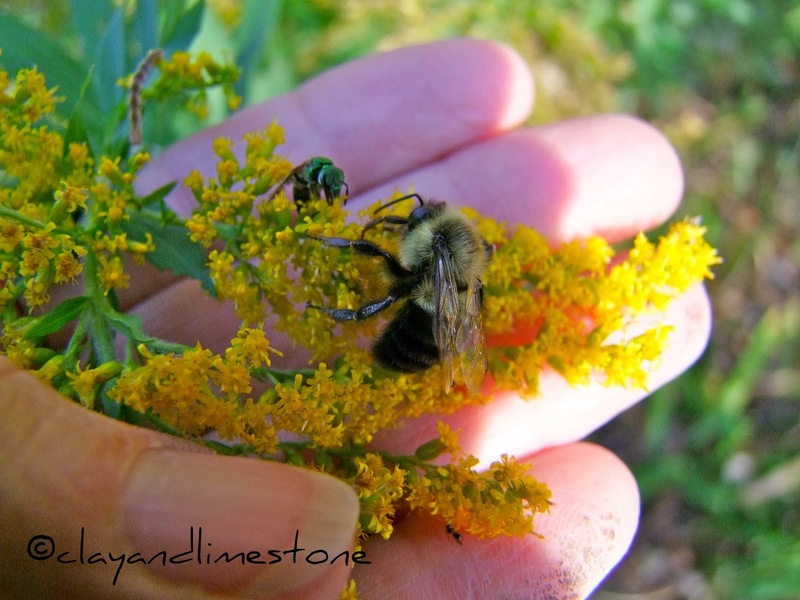 The wild Asters are glorious here on the farm in the surrounding fields, and the Goldenrod is the perfect companion. Isn't nature grand? The J. Anemones are a big favorite here with both the bees and me. That pink Salvia is gorgeous!